Profile Builder makes it really easy to manage default and extra user fields. Under the Form Fields tab, you’ll find an intuitive interface for adding, editing, deleting or reordering user fields. This gives you full control over the fields that appear on the front-end register and edit profile forms. 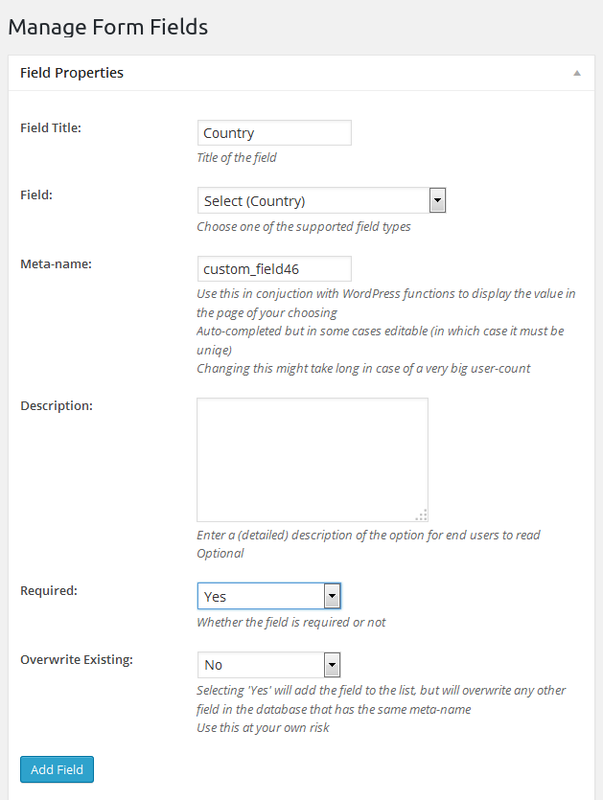 You can add a field to the front-end forms by simply choosing one of the supported fields from the Field type drop-down. After modifying it make sure to click the Add Field button and your new field will be added to the table containing the defined form fields. If, before using Profile Builder, you already have a couple of user fields saved in the database and want to display and manage them using Profile Builder, all you need to do is create each one of them from the Manage Fields -> Add New field interface, give them the same meta-name and set “Overwrite existing” option to “Yes”. 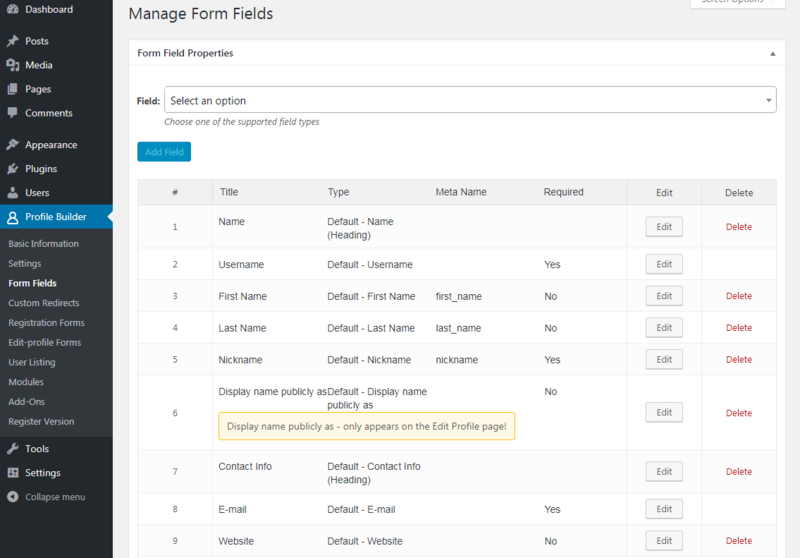 This way you’ll be able to display and update existing fields with Profile Builder. 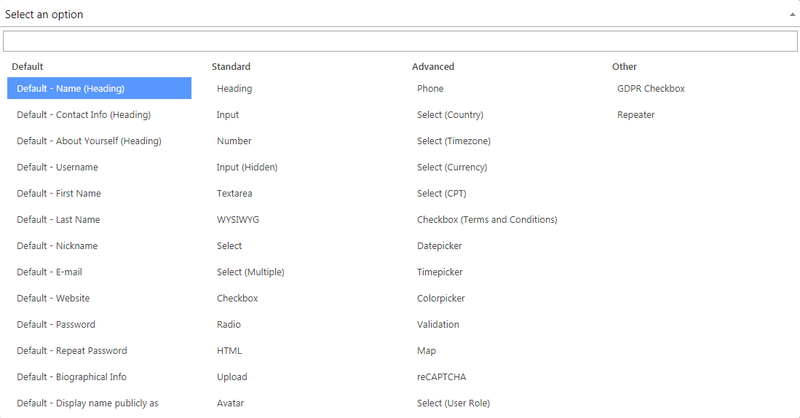 These fields are added by default in the Manage Fields window. When adding a new field, you can adjust the editable options of any Default Field. You can also edit the options of the already added fields, by clicking the corresponding Edit button. Manage Fields provides a Drag & Drop interface for sorting and reordering both default and extra user fields. You’ll be able to easily mix default and extra user fields to fit your needs. 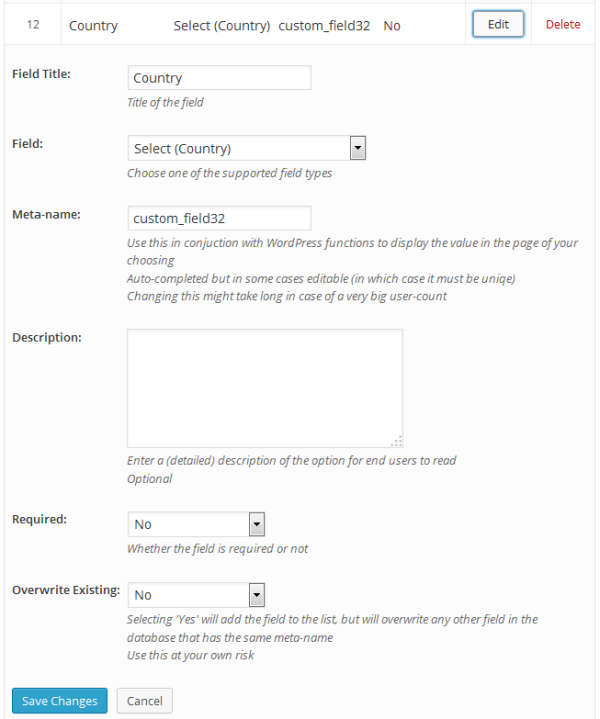 This way you don’t need to worry about the order in which you create your custom fields. You can always rearrange them to your liking. Editing or deleting a field is done by clicking the Edit or Delete buttons from the fields table. This feature is available in Profile Builder, Hobbyist or Pro. It allows you to show or hide fields based on user input.